If you find yourself looking for a fine pipe, then you have come to the right place. We offer a selection of what we call gentlemans pipes, all of which are handcrafted and finished in rich shades to offer you the pipe of your dreams. Our selection includes a variety of finishes and styles, ensuring that you can select the pipe that best suits your personal taste. Many of our gentlemanly pipes are made with acrylic mouthpieces, while some are made with wooden mouthpieces. The bowls of our gentleman pipes are all crafted in fine briar wood and stained by hand to ensure a rich, luxurious look that is impossible to deny. Some are sandblasted to create a unique textured look, while others offer a smooth, polished finish. Elegant and appealing, these pipes are a perfect accent to the look of traditional gentility, making them a great way to enjoy a leisurely smoke in the parlor of your home. The fine look also makes each one a statement piece that you can display on your desk when not in use too. We also offer a handful of churchwarden pipes, which are great for reading with, thanks to their longer stem. The gentry of any age would envy the owner of these pipes, as they are perfect for adding something classy and striking to your look and to your collection. All of our gentleman pipes come apart for easy cleaning and maintenance and most support the use of carbon filters. The pipes can also be smoked without filters according to your preference. 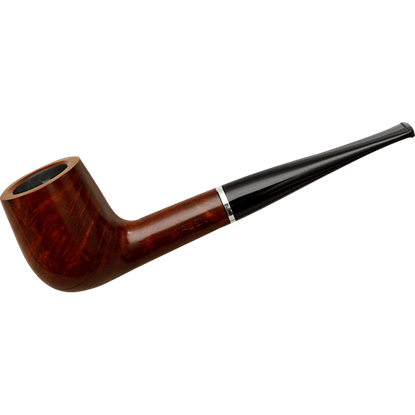 Epitomizing the classic style of a billiard pipe, The Royal Light Straight Billiard Pipe is sleekly designed for the ideal smoking experience. The cylindrical bowl is greeted by a thick straight shank for a look of pure elegance. I want to thank you for your excellent customer service, very fast shipping, and over all quality of your products and company. I have enjoyed doing business with you over the past few days and look forward to doing business with you again many more times in the future.